Published on September 6, 2009 in books and SQL Server. 0 Comments Tags: books, sqlserver. After a while (busy days…) I’ve got a new book: Beginning SQL Server 2005 Programming by Robert Vieira. That was really good choice! 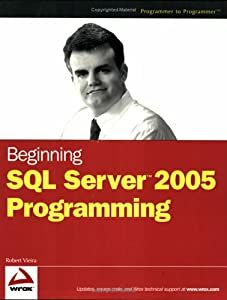 I’m still in the middle of the book but I’ve refreshed some basics on normalization, SQL Server storage, learned a few tips and tricks, possible approached, and of course learned a lot of things I’ve either forgot or never knew. I will probably forget some of what I’ve learnt but it will always be possible to get that book from the shelf and read about such an aspect.